Global Phosphate Esters Market size was estimated over USD 1.7 billion in 2017 and will exhibit growth of 8% up to 2025. 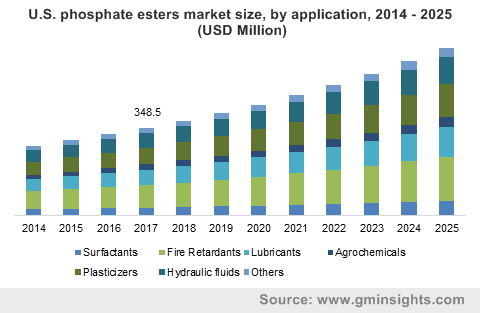 Phosphate esters market is primarily driven by its increasing applicability ranging from plasticizer and lubricants to Hydraulic fluids. Phosphate esters are a class of organophosphorus compound that are complex mixture of monoester, diester, free phosphoric acid and free nonionic material. These organophosphates esters find widespread usage in numerous consumer-oriented and industrial products where fire retardancy is a desirable property. It is used primarily as fire-resistant base stocks in several applications including turbines, hydraulic systems and compressors. Their excellent oxidation stability, high ignition temperatures and low vapor pressures will hinder ignition, while their low heats of combustion result in self-extinguishing fluids. Recent developments in the automotive industry, booming construction sector and stable developments in aviation & marine have propelled new potential uses of phosphate esters. They are excellent hydrotropes and are effective coupling agents which give outstanding wetting, emulsification and detergency. Flourishing infrastructural and agricultural developments and installation of new industrial plants in the developing markets are in favor for modern, state-of-the-art technology. These trends will result in emergence of new environmentally friendly products. Phosphate ester are considered among the most versatile surfactants. Their stability and solubility in alkali state is the major advantage. They have wide applicability in manufacturing household cleaning products such as detergents, soaps, fabric softeners etc. 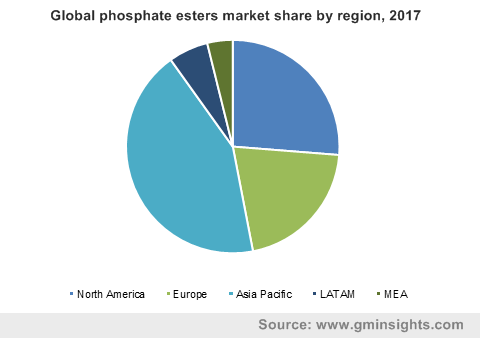 Steadily growing GDPs combined with rising per capita income of people in developing nations and increased usage of phosphate esters in several end-use industries such as aerospace, defense and agriculture are key factors contributing for growth in phosphate ester market share. Gradual shift in trend towards development of bio-based esters is anticipated to witness growth, which will eventually generate lucrative opportunities for medium to small scale manufacturers. However, shortage in the supply of raw material and their rapidly increasing costs are of great concern, since these costs are in turn passed on to the end-users. Based on Type, the global phosphate ester market has been segmented into Triaryl, Trialkyl, Alkyl Aryl and others such as bisphosphate. Based on volume, the triaryl segment will hold the maximum share of over 40%. Due to their anti-foaming properties, it finds significant usage in hydraulic fluids used in power steering systems, hydraulic brakes, aircraft flight control system, etc. The product also has extended application as fire retardants due to its enhanced self-extinguishing properties. Based on revenue, the trialkyl phosphate ester market size was more than USD 200 million in 2017 owing to its growing usage as plasticizers, lubricating fluids, nuclear-processing additives, and flame retardants. The growth in their applications has triggered an increased awareness of their environmental impact. 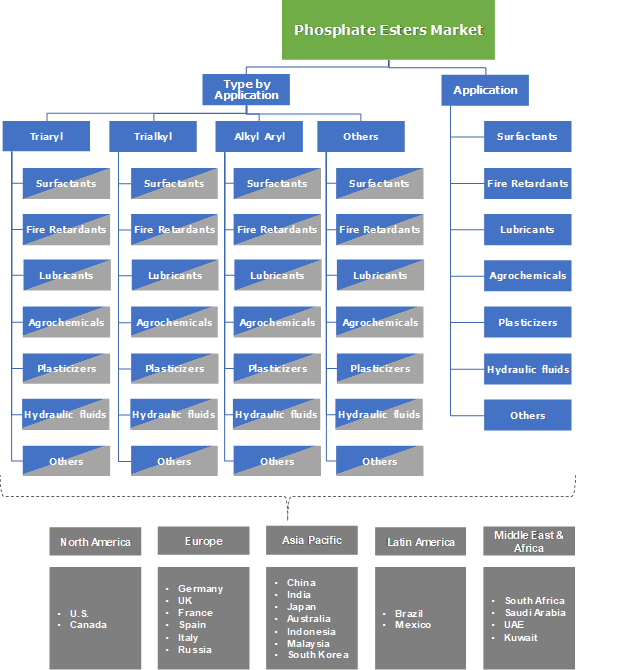 The global phosphate esters market has been segmented on the basis of application into surfactants, fire retardants, lubricants, agrochemicals, plasticizers, hydraulic fluids and others. The others segment includes paints & coatings, dispersants, emulsion polymerization, etc. In 2017, fire retardant segment held a prominent share of more than 20% of the global phosphate esters market. Growing population along with advanced living standards has significantly upsurge sustainable products. Phosphate esters are broadly used in automobile industry in die casting equipment and foundries, steel industry, and other industries where high temperature could pose fire hazards. Phosphate-esters are well known multifunctional additives for metalworking fluids. They are emulsifiers for expandable oils, as well as anti-wear additives, corrosion and staining inhibitors. In 2017, plasticizers application held the second highest market share of the global phosphate esters market and will witness growth at over 7% CAGR from 2018 to 2025. The major consumer product for phosphate ester as plasticized poly vinyl chloride are automotive & truck interiors, as vinyl-coated fabric upholstery, vinyl film upholstery, wire and cable coating and insulation. Based on revenue, Asia Pacific region is a key contributor with significant growth opportunities owing to rising demand for advanced consumer products and automotive production in the region. Additionally, China, India and South Korea collectively accounted for over 45% of the regional share in 2017. Recuperation in industrialized economies and a robust growth in the developing markets of China, India, Vietnam, Thailand and Indonesia will subsequently augment investments in industrial, aerospace & defense, construction & textile and oil & gas industries. For example, the government of China had incorporated 46 pilot projects, with focus on technological developments to impose smart manufacturing as an initiative to ‘Made in China 2025’. Furthermore, shift in manufacturing hubs due to availability of inexpensive labor and raw materials in India, Indonesia, Thailand, and China, are major aspects stimulating the revenue outflow of phosphate esters market size in the region. Lanxess AG, Solvay S.A., Akzo Nobel N.V., Elementis PLC, Eastman chemical company, Exxon Mobil Corporation, Ashland Inc., Castrol Ltd., Stepan Company, Dow Chemical company, Croda International Plc, Israel Chemical Ltd., BASF SE, Clariant, Lakeland Laboratories Ltd., Daihachi chemical co. are some of the prominent players operating in the global phosphate esters market. Recently, Swiss-based Clariant International Ltd. announced the startup of additional capacity for phosphate esters at its Germany plant, in order to expand their existing production at its knapsack facility. This new capacity enables the company to cater the growing demand from customers operating globally in the industrial lubricants, crop solution, paint & coating, and personal care segment. Phosphate esters has strengthened the performance of a wide range of industrial application through their use as emulsifiers, dispersing agents, antistatic agents and as extreme pressure additives for metalworking fluids. Phosphate esters has pandemic utility in industrial assembly, automotive, etc. In addition, increasing disposable income will propel private vehicle ownership of individuals, that will subsequently increase overall automobile production at a global scale. Additionally, rising socio-economic factors in the developing regions will have a positive impact on product demand.